Here we are, less than a week following iOS 12 beta eight with the ninth. This build has barely changed from what we've seen before, begging the question -- will this be the final beta? This build -- 16A5362a -- is only a couple removed from the last beta we received in the middle of last week. That explains why there were no noticable visual changes and extremely similar performance to the last time around. In our tinkering, we saw buttery smooth animations and not a single dropped frame. With performance like this, and a small increment from the last, we would not be surprised if this was the last beta preceding the GM. Check out what changed last time in betas 7 and 8. Great site and thank you for the articles HOWEVER, that is not what begging the question means. 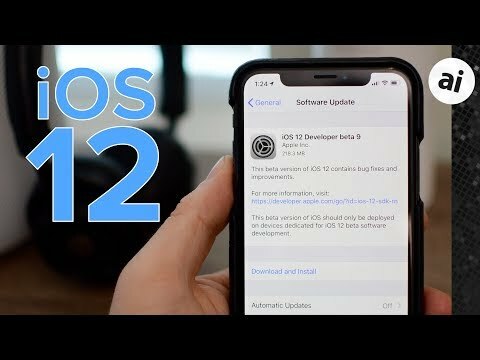 I can see a few more coming as we're still over a month away from the release of iOS 12. And usually, the beta will be called GM. As far as I know anyway. Left-handed people are better painters because right-handed people can't paint as well. The argument (left-handed people are better painters) is supported by the second part (right-handed people can’t paint as well [as left-handed people]), which is erroneous and also asserts the same basic premise as the first. This is the GM of iOS 12 because the next release won’t be. ... would be begging the question. I gave up on this one a long time ago. Even my well-read, well-educated friends use "begs the question" when they mean "raises the question". Stick it on the pile with "irregardless", "unthaw" and "ironic". And "a myriad of…". Sigh. The GM won't be labeled as a beta. The final build number will have the letter omitted and the feedback app removed. There is also a longer period between the final beta and the GM as Apple adds all the references to the new phones they will be releasing. Then another week and a half or so between the GM release and the public release. So we stand by our conclusion that this likely could be the final beta before the GM. Especially as there were only a couple builds between this and the last beta. I was very annoyed several years ago when somebody challenged me, saying “irregardless” is a word. We looked it up and sure enough it was in the dictionary. That proved to them it is a word. The definition said something along the lines of “common misuse of the word ‘regardless’.” Sigh. What does “unthaw” mean? Refeeeze? Back on topic, I’m really looking forward to iOS 12, the dropped frames in the Notes app are very distracting and make it difficult to use. If that’s all that gets fixed I’ll be happy. Is this the final beta? No, still bugs in this one. Invoking multi-app switcher seems a tad bit easier as in on X no longer need to drag higher up on screen to invoke the display of all open/running apps. Several iOS betas in the last few cycles have skipped the “GM” designation and have gone straight to official release versions. The only salient question I can see is whether Group FaceTime will be deferred to a future beta round—otherwise, the only changes I’ve seen in the last couple of beta releases have been CPU performance improvements on Geekbench. My multi core jumped from 9083 to 10216 going from beta 8 to 9. Pretty sure there will be bugs in the final release to the public, and every software release from every company until the end of time. These things are made by humans, after all. There haven't been many show-stopping bugs throughout this whole beta process, though. The only one that comes to mind was the occasional black screen of nothing in the Settings app during beta 6, but even that was a minor annoyance more than anything.